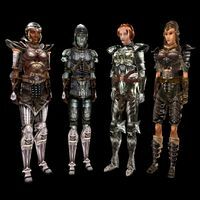 LeFemm Armor adds two new sets of armor, Domina Armor and Gold Armor, specifically designed for female characters. 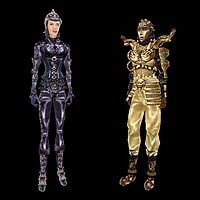 Additionally, the add-on includes female models for four previously existing armors which used male models on female characters; specifically Imperial Steel Cuirass, Imperial Chain Cuirass, Netch Leather Cuirass and Steel Cuirass. Unfortunately, these female versions of the old armors were not actually implemented into the add-on, even though the models were added. There are 3rd-party mods which correct this oversight; additionally, they are present in the Tribunal expansion. The new armors may be worn by both male or female characters, but will look a little funny on men. 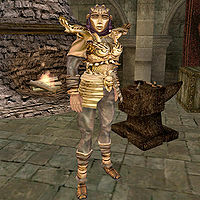 Gold Armor is sold by Lorbumol gro-Aglakh at the Vivec Guild of Fighters, and can also be stolen from the closet behind him. Gold Armor can also be found in the Redoran Vaults in Vivec. The armor is not owned by anybody, but the room it's in has a very difficult lock on it, and the room is guarded at all times by five Ordinators and two clerks for House Redoran, though you may steal a key from a desk in one of the manors in the plaza and no one will mind you walking in there. The key has no value, so it is not a crime. It is also worn by Sirollus Saccus at the Hawkmoth Legion Garrison in Ebonheart. He'd sell it to you, but he decided he'd rather wear it instead (see image to the right). The only way to get it off him without killing him is to use Disintegrate Armor on him until it breaks, then Calm to stop him from attacking you, and finally pickpocketing it from him, or you could simply sell him better armor, which he'll put on in its place. However, only Ebony or incredibly-rare Daedric will be good enough to convince him to remove the Gold armor. ^1 Can be worn by beast races. The armors that were left out by mistake. From the left, Imperial Steel, Imperial Chain, Steel, and Netch Leather. While the Domina armor isn't that impressive except for the looks, the Gold Armor makes up for a serious lack in quality Medium Armor in the game, at least partially. Unfortunately, it's missing Greaves, Boots, and Gauntlets, and neither set includes a Shield, so it's only a partial benefit (not to mention it makes male characters look silly wearing it). See the Adamantium Armor plug-in for another means of alleviating this lapse. Gold armor is still great for replacing the Indoril helm and cuirass which permanently anger all ordinators unlike the other parts of the armor. This add-on corrects the oversight of Sirollus Saccus not offering training. Female models are included with the plug-in for armors that normally display male versions on female characters. However they are not implemented properly, and will not actually appear on female characters. This bug is fixed in Tribunal. Esta página foi modificada pela última vez à(s) 15h05min de 26 de outubro de 2015.